(QITCOM 2014)The Ministry of Communications and Information Technology (ictQatar)the Prime Minister and Minister of Interior Sheikh Abdullah bin Nasser bin Khalifa Al-Thani. 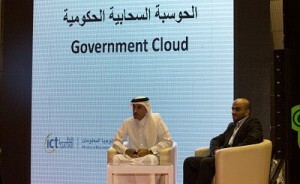 The Ministry of Communications and Information Technology (ictQatar) has launched Tuesday a set of cloud services for government agencies. The launch coincided with the Qatar e-Government 2020 Strategy 2020″, which was inaugurated earlier by HE the Prime Minister and Minister of Interior Sheikh Abdullah bin Nasser bin Khalifa Al-Thani. It also coincided with HE the Prime Minister’s launch of the third edition of Qatar’s annual ICT conference and exhibition “QITCOM 2014” organized by MCIT at the Qatar National Convention Centre (QNCC). The initiative aims to provide infrastructure for government’s ministries and agencies to facilitate and accelerate the development of e-government services as well as reduce the operation costs of information technology infrastructure. It also seeks to provide a common platform for electronic services that meet the best standards and practices in addition to offering a number of basic capabilities to ensure safe and reliable solutions to the government sector. Assistant Secretary-General of the Government Information Technology at ictQatar Hassan Jassim Al Sayed stated that this initiative is consistent with the Ministry’s vision that calls for the necessity of providing technical capabilities to support government agencies to promote their performance, noting that the cloud computing services are one of the latest developments in information technology domain.